In a bowl, combine the 2 tablespoons of the oil, salt, thyme and pepper. Mix well. Add potatoes. Toss lightly to coat. Spread potatoes in ungreased baking pan. Bake for 10 to 15 minutes or until potatoes are tender, stirring once. Stir bell pepper and remaining oil. 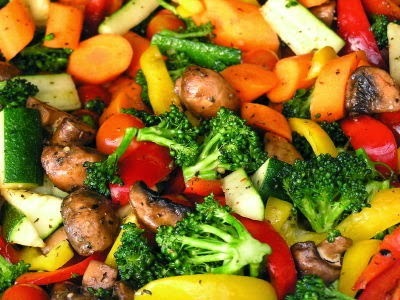 Cook for 5 to 8 minutes more or until vegetables are crisp tender.